(Newser) – A California man who was possibly trying to burglarize an abandoned Chinese restaurant has been rescued from the grease vent, where officials say he had been trapped for two days, the AP reports. The Alameda County Sheriff's Office says deputies and firefighters were called to the vacant building in San Lorenzo on Wednesday after someone heard cries for help. 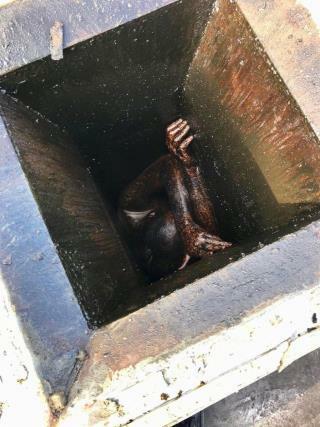 It says that when officials arrived they found the grease-covered man stuck inside the metal vent. The sheriff tweeted that the man was trespassing and possibly trying to burglarize the empty restaurant. Alameda County Sheriff Sgt. Ray Kelly tells the San Francisco Chronicle the man was in generally good condition despite being exposed to the cold and the elements. Kelly says the unidentified man was checked into the hospital, and deputies will decide later whether to book him into jail or issue a citation. He’s probably a junky living in moms basement. Throw the book at him. Two days at a Chinese restaurant and he was still hungry 30 minutes later.